Thien Thanh Boutique Hotel lives up to the boutique title. 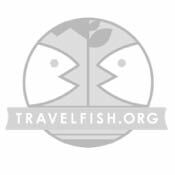 Average rating 8.2 from 291 reviews. A 2012 refurbishment has transformed it into a quaint, charming spot despite the fact it is on Ba Trieu, a road packed with backpacker joints. The 16-rooms come with great service and lovely extras such as a swimming pool and large deck with paddy views. It’s not usual to find such greenery so close to the old town. This is the perfect spot to mix town and country, within a 10-minute walk of the historic centre and one of the quietest centrally located hotel we have come across. There’s an instant ambience as you climb the narrow stairs -- like most hotels close to the old town, there are skinny stairwells and no lift. Rooms at the back overlook the morning glory fields, and you can lap up the view from the private balcony. These balcony rooms at the back are worth the extra dong. The interiors are well-appointed and have Vietnamese flair with red and black accents carried throughout. Rooms have a purpose built solid wood desk/vanity/minibar equipped with a kettle, a flatscreen TV, WiFi, air-con and a swish bathroom with modern fixtures, sink with countertop, hair dryer and bathtub with rain showerhead. They’ve perhaps gone too fancy for their own good, using stepping stones surrounded by pebbles for the flooring. The standard rooms are small windowless boxes with just the right amount of furniture and correct layout to make it feel uncluttered. It would be ideal for one, cramped for two. The showstopper is the suite in the eaves, with its exposed Hoi An-style tile ceiling and panoramic views across the city. The big selling point is the pool and the large deck with loungers and tables. From it you can hear more bird song than motorbike honking. It’s a little oasis, and it’s priced just right. The rate includes breakfast. 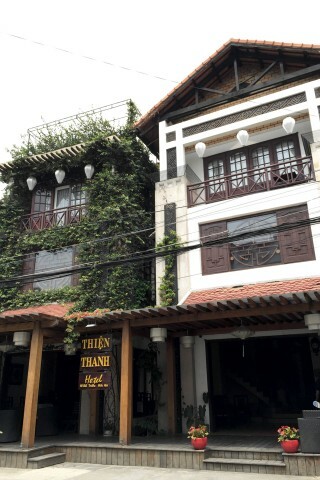 Check rates at Thien Thanh Boutique Hotel on Booking.com.